We forgot about mashed potatoes. The rolls weren’t done on time. There weren’t enough chairs for everyone. Babies got jealous of each other nursing and cried. The whipped cream never came out of the fridge. There was wayyyyy too much leftover ham. I only took two pictures all night. I really might have outdone myself this time. My inspiration for this party was Daniel’s favorite things: soft pretzels, backyard games, a bunch of his best bros, a cigar bar, and a scotch tasting. I borrowed tables and chairs from our church, tablecloths and burlap runners (and the tree trimmings) from Dara, and started each place setting with a beer flight placemat from Target and a mini bottle of Jack tied to a bottle of Coke. I got to re-purpose my donut wall from Brianna’s baby shower for the soft pretzel bar, and desserts included chocolate cake in a jar and homemade cupcakes (chocolate whiskey and peanut butter cup). My favorite part was the cigar and scotch bar. The vintage matchbooks were a unique touch, and the scotch was a Scottish Highlands brand that was new to most of the guys, but a huge hit nonetheless! But before you start thinking that this party was perfect…let me assure you that one thing went terribly, terribly wrong. And that was the beer cheese. I had found a recipe on Pinterest that looked super easy, and it was super NOT. I don’t know exactly where I went wrong, but this was a MASSIVE party fail. Just goes to show that you never know what happens behind the scenes! If you need help planning a party, let ya girl know – I’d love to get ice cream or coffee with you sometime and talk about your vision! One of my favorite things to do, weirdly, is go back through all of my pictures on my phone. I always come across random things I documented that I forgot to post on social media, or funny screenshots of texts from family members, or ideas for parties that I wanted to save on Pinterest. I especially love getting to relive good memories, and this last photo purge was FULL of them! #1: The Park. What a blessing it was to spend time with my dear friend Brittany and her cuties earlier this summer. She actually has another boy now, too – I think an east Texas road trip is in order to go meet him! #2: The Coffee Shop. A new coffee shop opened in Durant this year, and even though I’ve only been a few times, since I’m not a coffee drinker, every visit has been spent with good friends. I love the atmosphere of the place, and I’ll definitely use it for a shower or two in the future. #3. The Woods. Boy, have the Love County woods been good to us. I absolutely love going to see Daniel’s family and adventuring on their land! It’s my favorite place to take Fitz because he can run around like a maniac, we take four-wheeler rides on the trails, and we get to revisit the spot where we married 6 years ago. And also I get to snuggle my nephews (one of which has too much energy to actually snuggle or take pictures with me), which is always a good time. :) Also, this picture is already so out of date – Luke is HUGE now! #4. The Desert. I had the privilege of traveling for work earlier this year – Merrill Lynch hosted us at their annual client conference in Scottsdale, Arizona. And HOLY. MOLY. I felt like a queen! The resort was beautiful, my suite was huge, and there was so much attention to detail: chocolates on the pillows, mini jars of honey for your tea, and my toiletries were even organized for me by the housekeeping staff. One of the best parts of the trip? The “field trips” they took us on: dinner, dancing, and hot air balloon rides in the desert, and an evening at the Musical Instrument Museum. We were so spoiled for days with delicious food, musical performances, and guest speakers, including Barbara Corcoran from Shark Tank! One of the best things that happened all summer was Mother’s Day weekend with my bestest best and her little family. After YEARS of hard work, Jennifer graduated from med school and is officially a doctor!! I am so crazy proud of her. Last Sunday, I had the great privilege of throwing a baby shower for my sweet friend Dara, and it was the cutest thing, if I do say so myself! Dara and her husband Les are in my community group from church, and we were just over the moon for them when they told us she was pregnant. 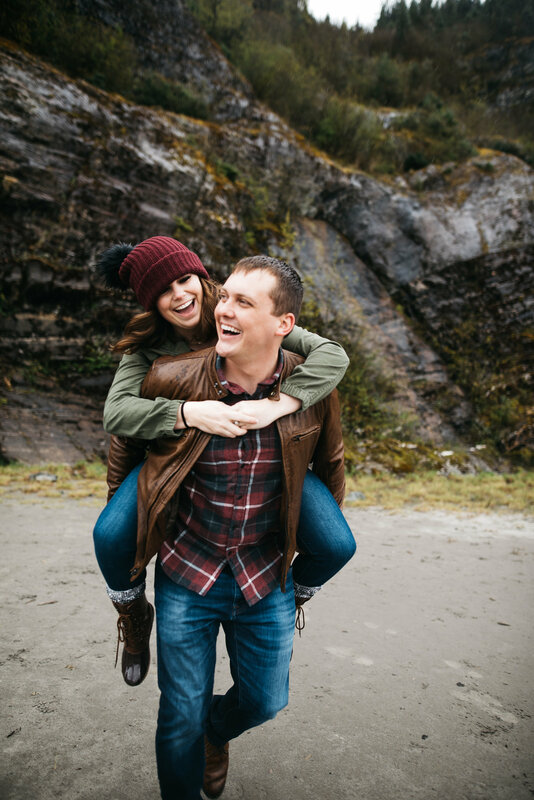 I knew instantly that I had to throw her a party – that was the easy part. The hard part came when it was time to pick a theme, because the Wesberrys decided to wait until the birth to find out if “Baby Berry” is a he or a she! Soon after they told us the news, our group quickly started referring to the baby as “Baby Berry,” so I decided to carry the berry motif into the baby shower too. At first, I worried that it might be too girly, if Baby Berry is a boy, but then I thought…who cares?? The shower is kiiiiiind of for the baby, but mostly for Mama, and I definitely want a shower that the mom likes. Dara is super girly and always looks so cute, so I knew this theme would be right up her alley. We played a couple of games, including a hilarious round of Baby Pictionary, but my favorite activity was making a birth day banner for Dara. I bought a blank pennant banner and gave each person a piece of it to write out an encouraging note or prayer to Dara. After I strung all the pieces back together, I gave it to her to put in her “go bag” so she can hang it up at the hospital for encouragement while she’s in labor! 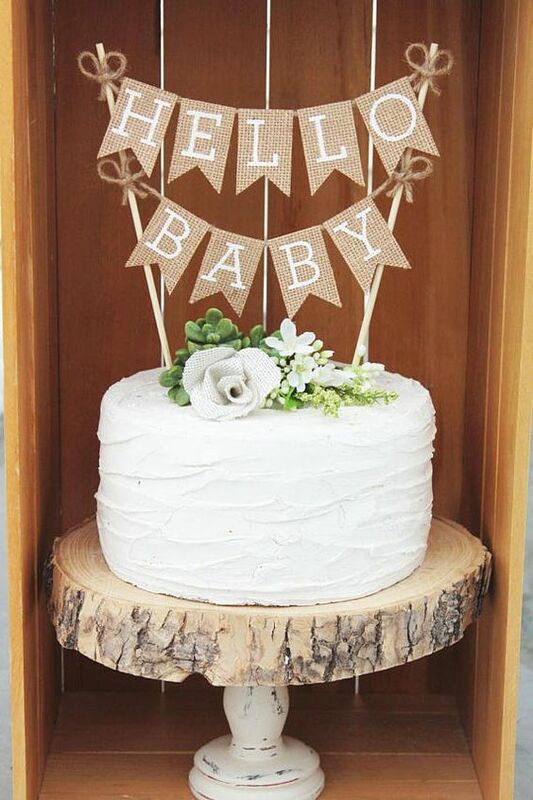 I absolutely adore this idea, and I hope to replicate it at every baby shower I host from now on. 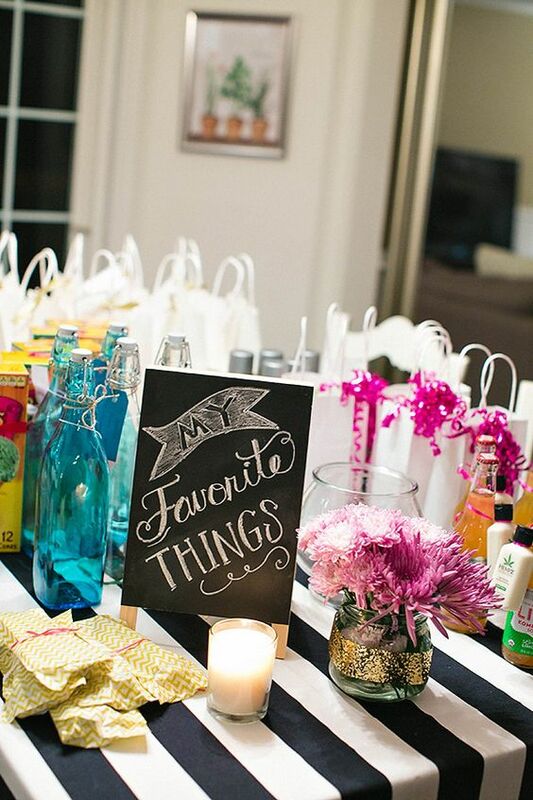 On the way out, guests grabbed favor baskets – berry baskets filled with a bottled drink, a ring pop, and a note encouraging them to “Pop It When She Pops” and enjoy a toast on whatever day Dara has the baby. Hi friends! If you’ve been following my blog for awhile, you know that I absolutely lovvvvve planning parties. I’m always on the hunt for a new theme, and my favorite ideas always involve unique, memorable details and themes that haven’t been ‘overdone.’ In my spare time over the last few months, I’ve been daydreaming about some of the events coming up this year, so in honor of those sweet dreams – here’s a list of a few parties I can’t wait to host! I can’t understate how long I’ve been desiring to make this one happen. 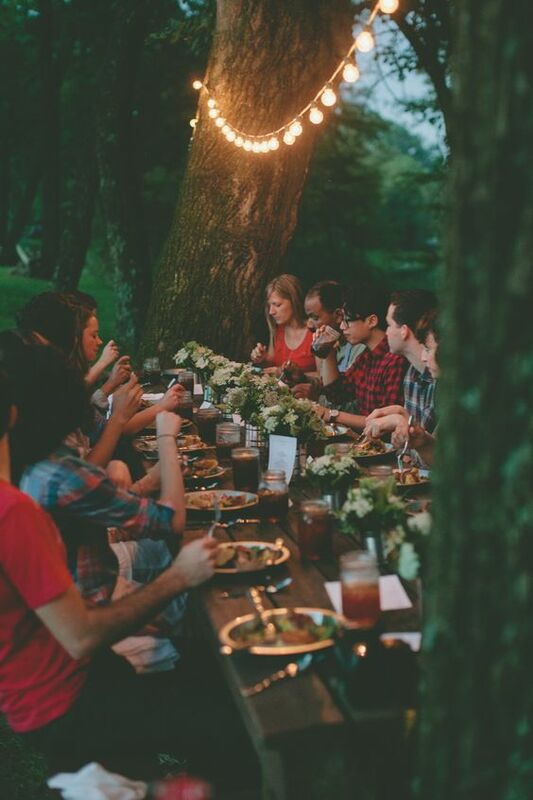 There’s something so cozy-feeling about combining your best friends, good food, a fire pit, music, a summer night sky, twinkly globe lights, and eating family style in the comfort and familiarity of your own backyard. Ooh, and s’mores! I heard about these on Pinterest several years ago, and I thought it sounded like so much fun! You invite a bunch of girlfriends, put out some yummy snacks, and everyone brings and leaves with a bag full of handpicked goodies – candles, bath products, candy bars, kitchen tools, etc. Each person brings five duplicates of her favorite thing for others to try, and she gets to go home with five of her friends’ favorite things! 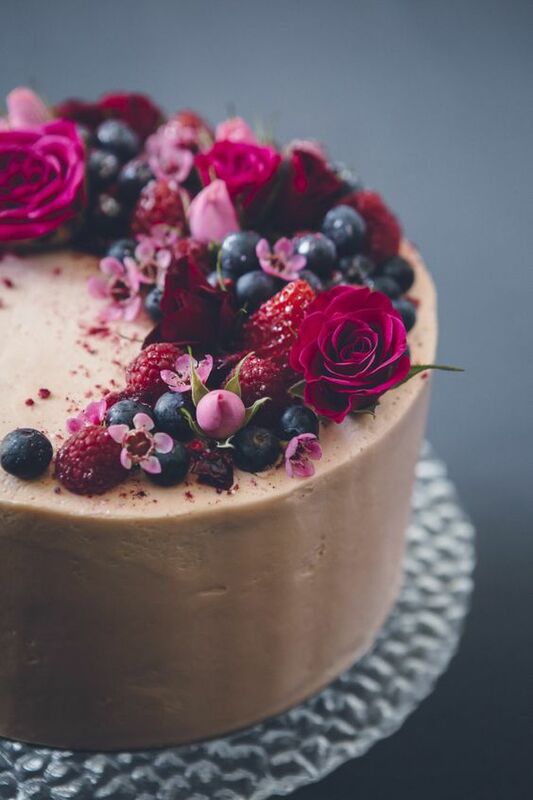 I honestly don’t even care when or where or why…I just want a reason to make a cake that looks this gorgeous and delicious. If you had an unlimited amount of money to throw a party…what would you do? Where would it be hosted? What kind of food? What kind of entertainment? Sweet mama Hannah and some of her sisters. ♥ It was so funny – after I took this picture and looked at it to make sure everyone was smiling, I said, “Hannah, you barely even look pregnant in this picture!” Most pregnant women probably would have been happy to hear that, but Hannah’s face fell and she said, “Oh no, let me turn sideways! !” It made us laugh! To everyone’s surprise, baby Luke decided to come a few weeks early! Thankfully, he has been a super healthy, super chill baby, which is exactly what Hannah needed. He looks so much like his brother to me, and I’m already obsessed with him. Being an aunt is pretty great! Our dear friend Sheridan wanted to throw this party to celebrate her husband, Jeremy, and asked if I would mind helping/hosting, to which I immediately responded “YAAAASSSSSSSSS.” With the help of a few friends, she was able to bring her amazing vision to life, and I am still so impressed with how this party came together! In keeping with the Stranger Things theme, she tacked up “Missing” posters of Barb, Will, and Jeremy all over the house. She also set up display on the stairs featuring Dungeons and Dragons, a record player, a baseball bat, and a bicycle! I painted the Castle Byers sign for her, which they used in the living room. String lights were everywhere, of course, and the living room was transformed into one giant blanket fort. 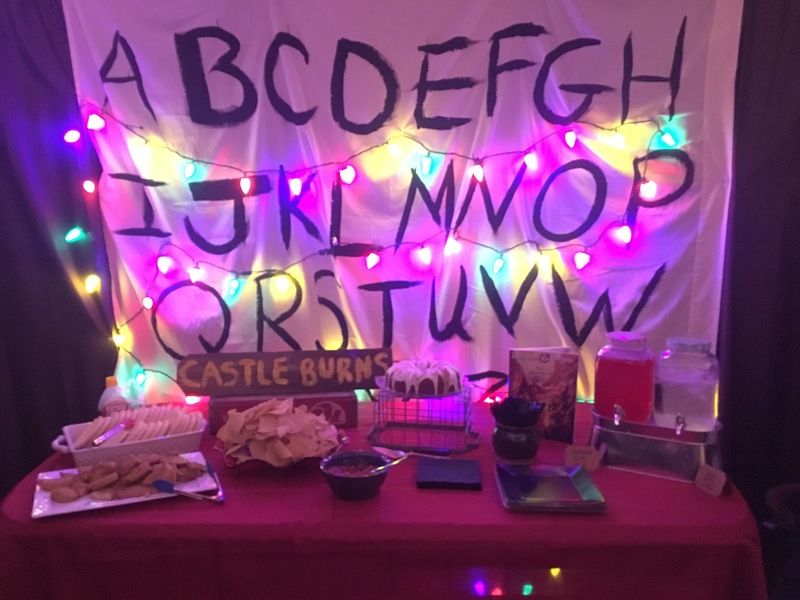 The dining room was the pièce de résistance, though – we couldn’t have a Stranger Things party without the infamous alphabet wall! Even though Brandon almost ruined it….lol…thankfully Jeremy was COMPLETELY surprised when they came inside! We had so much fun hanging out, listening to the Stranger Things soundtrack, and snacking. For the food, we set up an Eggo waffle bar with loads of toppings (including fried chicken strips! ), chips and salsa, birthday cake, and “Demagorgan Blood” punch. We had asked guests to come dressed in 80’s costumes or like a character from the show, so I dressed up as Barb! After we all took some pictures together, we settled in to watch the first episode of the newest season together, and ended up watching four or five more episodes before the night was over. Are you as ready for Season 3 as we are?? If you need help planning a party on a budget, picking a theme, or figuring out a menu or decorating scheme…let me know! I’d love to schedule a consultation with you (“consultation” can be defined as “let’s go get ice cream and hang out”). Easily my favorite decorations from the party. I made faux Sparkle and Poise magazine covers as a nod to the movie and printed them off to put in the frames. Once I decided on the theme, the decorating was easy. I opted for a “sleepover” decor scheme, incorporating slumber party necessities like junk food and beauty supplies. I bought the gold “30” balloons, some teen magazines, and scrunchies, and borrowed a few things from my own stash, including the big white chalkboard. All of the serving dishes and table decor are things I’ve picked up over the years, and I’m glad to have such a big inventory to draw from. I also owe a big thank you to Paige Scott for letting me borrow her daughter’s dollhouse!! It was the perfect movie tie-in and statement piece, and it got lots of compliments. For the food, I decided to do an 80’s themed candy bar with fruit roll-ups, gummy bears, Ring Pops, Sour Patch kids, and – of course, Razzles. We also had bottles of Coke, popcorn, and cherry chip cake, Courtnie’s favorite! That cake though – I am super proud of that cake. You don’t even know. It’s the first time I’ve ever tried to make a cake with flat layers, and thanks to some tips from my mom, I did it! AND I even frosted it as a semi-naked cake without messing it up. SO. PROUD. This party was so fun, and I can’t wait to plan more birthday parties in the future! This baby shower actually took place last September – MAJOR blogger fail. *facepalm* But I still had to post about it, even if it’s a few months late! This party was just too cute not to share. You guys, I have to confess something. I am OBSESSED with the donut wall trend! I absolutely love it, and I knew I had to make one for Brianna and Dillon’s baby shower, especially since they were having a girl. The best part of hosting this shower was that I didn’t do it alone – I had SEVEN co-hosts! Community is such a good thing, y’all. ♥ We had the best time *sprinkling* the Perry family and helping them get ready to welcome sweet baby Mallorie into the world! My inspiration for this party came from two things: sprinkles and a “mom-osa” bar! It was super easy to plan around a donut theme, and nearly everything was DIY, including the donut wall itself. I got a big piece of pegboard at Lowe’s and had it cut to the size I wanted, covered it with a few coats of spray paint (only needed one can! ), and stuck some pegboard hooks through the holes to hang the donuts on. So simple! For the games, we played Baby Names A-Z and had a “create a headband” station. The Baby Names game was a race, and whoever could list off baby girl names for every letter of the alphabet the fastest won. At the headband station, guests could choose from a few pre-made baby headbands and decorate them however they wanted – beads, flowers, lace, etc. Before leaving the party, guests were encouraged to grab a paper cone of donut holes to take with them! I found the cones on Amazon and got the stickers personalized from The Party Penguin shop on Etsy. If you need help planning a party on a budget, picking a theme, or figuring out a menu or decorating scheme…let me know! I’d love to schedule a consultation (a fancy word for “let’s get ice cream and chat”). Have a lovely week! It does NOT feel possible that tomorrow is the first day of November. October went by in a FLASH, and boy was it full! I’ve got lots of content planned, but here’s a little preview/life update in the meantime! This wasn’t technically in October, but I hosted a sprinkles-themed baby shower for my friend Brianna and her baby girl Mallorie, and it was so perfect!! I’ll share more pictures soon. I can’t wait to meet Mallorie in a few short weeks! Daniel and I got to take a trip to Las Vegas at the beginning of the month, because I EARNED IT. Still doesn’t feel real to say that, even though I’ve got the pictures and everything to prove it. I met some goals in my MONAT business this year and earned this trip, for free. We stayed at the Planet Hollywood resort, and it did not disappoint! Fitz continued to be adorable, like always. 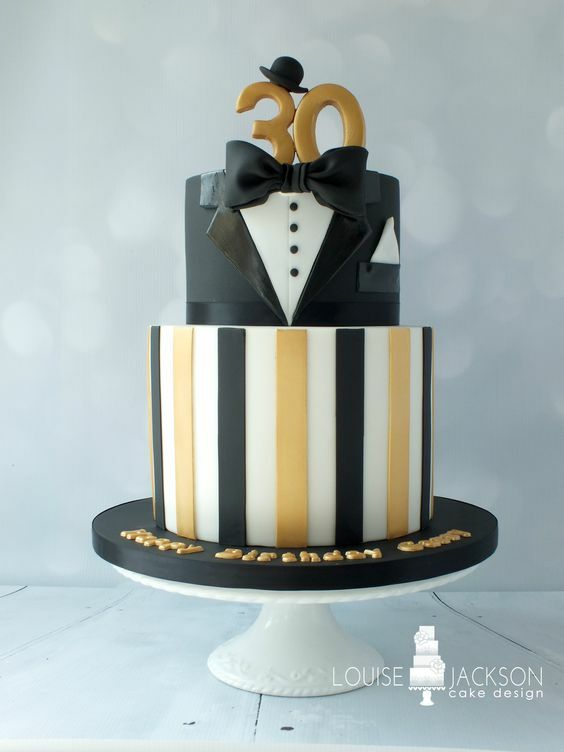 I also got to check something off of my 30 By 30 list – throwing someone a surprise party! And what an EPIC surprise party it was. My friend Sheridan wanted to throw one for her husband, Jeremy, and asked me to help. It was incredibly nerve-wracking keeping the secret and hoping it didn’t get ruined, but we pulled it off! Jeremy was very surprised, and we had a blast celebrating with everyone. And it’ll be really hard to top a Stranger Things theme.